Volt Runner is my personal project car. I created it for my personal transportation needs and for education and demonstration of the electric vehicle's viability to contribute to greenhouse gas reduction and reducing our dependence on burning fossil fuels for personal transportation needs. In late 2006, I decided it was time to start thinking about replacing our 2002 Prius. We had been driving it for over 5 years from the time we took delivery in October, 2001. My policy for replacing a personal car was that the new car needed to have an EPA mileage rating of twice the fossil fuel mileage of the car being replaced. I determined there was not a satisfactory, mass produced car having an EPA rating of at least 86 mpg. I quickly concluded that some type of plug-in electric vehicle would be the solution. The Seattle Electric Vehicle Association (SEVA), http://SEVA101.org, popped into the forefront as the most important resource in my quest. 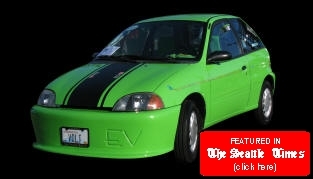 In late 2006, SEVA consisted of a relatively small group of passionate local EV builders and drivers, a few of whom had been carrying the EV banner for about 30 years in response to the 70's oil crisis. I began attending SEVA's monthly meetings to get the inside scoop on the status of all types of electric vehicles. Based on what I was hearing at the SEVA meetings, I looked into retrofitting my Prius with a plug-in battery pack to extend my range, but found these were only available for the second generation Prius. I looked into Neighborhood Electric Vehicles (NEV) and found they were too slow to go on any highway and I needed to travel between Bellevue and Seattle across the highway floating bridges. Neither did they have the range to make the round trip around the north end of Lake Washington without having to wait for an 8-hour battery recharge at the half way point. By mid-July, 2007, it was clear I would need to recycle an Internal Combustion Engine (ICE) vehicle into a pure battery electric vehicle and this would require a lot of assistance from my fellow SEVA members. In mid-December, 2007, we rolled a 2000 Chevrolet Metro hatchback into Dave Cloud's garage and started the process of recycling it into my EV, Volt Runner.